Memento Mori – William Michael Harnett, 1897. This painting intrigues me. A few weeks ago we were at the art museum and were asked to pick out a painting we loved. Well, I picked out this painting – but not because I loved it. It’s not the sort of painting that belongs in a heart, or a soul. It belongs in the mind. It’s title… the whole aspect of the painting seems to send shooting messages everywhere: “You’re only human… so little time… sieze the day!” I also am drawn to it by the many correlations to Hamlet, by Shakespeare. I won’t go into detail, but you can look up the painting and study it somewhere. Or the scariest holiday of the year. Halloween is a mix of a bunch of different things. Probably it’s most relative to the ancient Irish tradition of Samhain, later called “All Hollows Even (Evening)”. Samhain celebrated the end of the lighter season and the beginning of the darker season. They believed that during this time, the walls between this world and the Other world grew thin and spirits were allowed to pass through, being honoured guests at their descendants homes. However, evil spirits also came through, and so, in order to protect themselves against the harmful spirits, people would dress up in costumes. There would be bonfires… odd sorts of rituals.. etc. In the late eighteenth century, children would dress up and, going from door to door, perform acts of entertainment in exchange for food or coins. These traditions have been carried down into different cultures—Poland and Mexico celebrate a similar holiday called Day of the Dead. All Saint’s Day was celebrated in England, but was called “All Hallows Even” Hallows meaning Saints. They celebrated the saints, known and unknown, and honored them. But anyways… that’s just a historical background. I wanted to talk about Halloween, and what it is today. Just a fun day to dress up and get candy, huh? Well that’s fine… just fine. I mean, what sensible child doesn’t want to dress up and get candy? The fact in and of itself doesn’t bother me. It’s what they choose to dress up as that irks me. Goblins… witches… ghosts… Frankenstein… the devil… to name a few. I’m aware that not everybody dresses up in these costumes – but the majority seem to. A lot of houses don’t have tons of decorations – but some do have the purple spider webs on the bushes, or a skeleton on their door, or something of the sort. I’ve seen houses that almost look scary. A mechanical coffin with a man popping out of it every five seconds. I’ve seen yards littered with this kind of stuff. What makes people want to do this? What is it that’s so appealing about witchcraft, skeletons, ghosts, blood? It’s in a sickly sense, too. I think Halloween is an appeal to the dark side of humanity. Halloween is a dark holiday. Everything about it is associated with darkness. It’s rooted in superstition and untruth. Why would you celebrate a dark holiday, when you can celebrate one that represents light? On October 31st, 1517, Martin Luther nailed the ninety five theses to the door of the Wittenburg Church in Germany. The church, up to this point, had been living in darkness. People couldn’t even read their Bibles, and so superstitious were they that they believed the fact that salvation could be bought. They knew literally nothing about their God. And the church didn’t even help matters – worsened them, actually. The people’s disadvantage was taken advantage of. They were falsely preached to – the church itself was corrupt with all manner of sins. Martin Luther revolted against this. He… along with John Calvin, John Knox, Jan Hus and other reformers in different countries, instigated a insurrection against the distorted church. 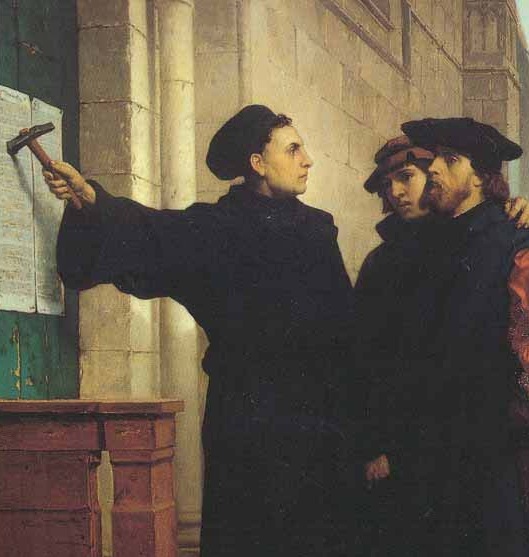 It was the beginning of a Reformation that would spread through many, many countries and bring the light of truth to people who had been living under darkness. Funny how Reformation Day is on the same day as Halloween. If someone put a choice before you, which would you celebrate?